Azpects EASY4Cracks, incorporating Dseal technology, is the only successful professional grade hot Asphalt/rubber base fill material that is now available for homeowner applications. EASY4Cracks is ideal for repairing cracks in driveways, seams between the driveway & garage floor, the driveway and pavement as well as cracks in paths, concrete and wood. It is also great when used to repair bitumen flat roofs and sealing joints around manhole covers. These can now be repaired at a fraction of the cost of a professional repair. You do not need to purchase expensive contractors equipment, now the DIY (do it yourself) home owner can make inexpensive repairs to their property themselves. This revolutionary new product, designed for the homeowner but also suitable for the professional contractor, is a commercial grade high quality, low cost, easy to use, safe alternative to costly contractor applications. Our hot applied liquefied filler is far superior to the cold fill process, its bonding ability is better, and it expands and contracts with temperature changes without cracking, keeping water and other weather elements out thereby preventing further damage to property– therefore saving you money! 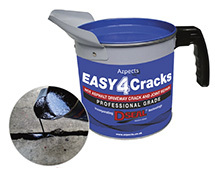 EASY4Cracks is available to purchase from our merchants and stockists in a ‘Full Repair Kit’, a separate ‘Kettle box’ and 0.9kg handy refill boxes. The Full Repair Kit comes with everything you need to make a full repair to your property. It comes with an electric heater, kettle, metal stand, spatula (for smoothing the filler) and drip pad. Each kettle comes complete with 1.8kgs of filler inside and has an integral handle and spout for ease of heating and applying. The hot crack filler is heated with our ‘DSeal’ electric heater, which is included inside the ‘Full Repair Kit’. It melts the 1.8kgs of crack filler in about 10-15 minutes, without the need to stir the filler, making it a much safer process. Our EASY4Cracks refill packs are available to purchase separately and are easy to use. Simply take the refill from the box and pop it, with its plastic wrapper, into the kettle and repeat the heating process, they melt quickly and are ready to use straightaway! When applied properly EASY4Cracks will double the life of the damaged area, be it a joint in a driveway/pavement, or a crack in a flat roof. Cold patch repairs generally only last up to a year whereas EASY4Cracks, with its hot liquefied application, will last up to 6 years! It is temperature resistant and will not become sticky when exposed to high temperatures and will not crack in cold temperatures. Whilst it may soften in warmer weather this does not compromise the seal. Why do cracks appear in asphalt, concrete and flat roofs? Most elements have their own natural life span but this can be significantly shortened if conditions do not favour them. Typically reasons like weather conditions, excessive traffic usage, evasive plant roots, geological changes, erosion and weathering (frost action), can speed up the damage. These can open up cracks and let in the elements making them worse over time. Why do we need to maintain our pavement once it appears cracks? Generally if you don’t repair a crack it will get worse and eventually become unrepairable leading to the whole area needing to be replaced, costing considerably more money than a quick and easy repair with EASY4Cracks. One example of how damage can continually occur and get worse over time is down to ‘frost action’. In cold climates like The UK, water seeps into a small crack in the pavement – when the water freezes, it expands, making the crack bigger. When this ice melts, a greater amount of water seeps into the enlarged crack. This process repeats, each time making the crack larger and prone to further damage from, say for example a driveway, vehicles driving on the crack, potentially causing the top layer of asphalt or concrete to break off forming a pothole. Another example, in warmer weather, the constant wear of vehicles & heat from the sun dries asphalt and causes the top surface of the asphalt to crack, which can widen when rain water gets into them. Little cracks in driveways are usually caused by plant roots which if left unchecked will get bigger as the plants grow and cause concrete and asphalt to crack and break up. That’s the reason why it is so important to maintain your drive, paths and flat roofs etc. Why hot sealant is better than cold sealant? We reckon that hot pour sealants perform better than cold pour sealants. Our hot-pour crack sealer, EASY4Cracks, needs to be melted and applied, it fills cracks easily and quickly, when it has cooled it is still pliable with a rubber-like consistency, that can still expand and contract with the crack. Cold-pour crack sealers that are applied to cracks in a liquid form dry solid and are not flexible making them prone to cracking and being forced out of joints during the UK winters! These cold-pour crack sealers usually do not perform as well, due to their lack of flexibility when dried. The EASY4Cracks hot sealant bonds well, extends the life of the damages area due to its superior material performance and water resistance. Azpects have entered into an agreement with DSeal to sell their hot sealer product. DSeal is a product brand from Orderbid International Group, headquarters are in China. The DSeal sealant product has been developed by their technical engineering group and tested by several professional pavement maintenance organisations. The Dseal product offers cost-effective performance & improves the life span of driveways, paths and flat roofs. EASY4Cracks can be subjected to traffic or other stresses within 20 minutes of application, depending on the thickness of the repaired area. EASY4Cracks sealant can be heated in the kettle in about 15 minutes with our DSeal EASY4Cracks heater. The Kettle comes complete with 1.8kgs of EASY4Cracks that can fill a crack 12 metres long by 1cm x 1 cm. EASY4Cracks can be used to repair bitumen flat roofs and around manhole covers. Why do I need to use the EASY4Cracks Dseal Heater? To ensure the safe heating of the EASY4Cracks we have included in our Full Repair Kit a dedicated heater, supplied by DSeal which has been designed to keep our customers safe during the heating process. After a great amount of experimentation Dseal found their heater is the fastest and safest heating device for their viscous material. It only takes about 15 minutes to finish the whole heating process. What’s more, the whole heating process is really easy to operate and it only needs one person to perform the heating task. The whole heating process is automatic, the heater will shut off when the asphalt reaches the correct melting point. Always turn the power off at the mains when the heater is not in use. What kind of situations do I need to add sand / stone to the cracks? When the cracks/joints are larger than 5mm, you may want to add some coarse sand or small gage aggregate to bulk it out before applying EASY4Cracks filler. Why does the hot sealant needs to be applied in dry conditions? Applying EASY4Cracks in a damp, wet or humid environment will affect the stickiness and overall performance of the filler. It must be applied in dry conditions to ensure the effectiveness of the hot sealer. Once applied and set it will seal the crack resisting the ingress of water and moisture whilst remaining rubber like and pliable. EASY4Cracks is a commercial grade, high quality, simple and safe to use product. It is far cheaper than alternative contractor applications and ideal for the competent DIYer. It is a hot applied liquefied material which is far superior to the cold process giving superior bonding and resistance to cracking. It also seals keeping water out thereby preventing further damage and prolonging the life of your driveway or path. Before using ensure you are working in a safe environment, wear long sleeved shirts, trousers, protective gloves and glasses.